Chief is now shipping its newest Fusion mounts, loaded with fresh, installer–friendly features that keep all the benefits provided by the previous version. 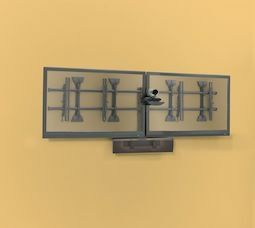 A new line of accessories is also available and works across wall, free–standing, and ceiling mounted Fusion solutions. "We're constantly looking to provide more value to the customer," said Kathryn Gaskell, product manager. "It's all about them and what we can do to make them happier each day." The new fixed and tilt mounts still include the hallmark 4 Cs of Fusion— including Centerless lateral shift, ControlZone height and roll adjustment, Centris low profile tilt, and ClickConnect tool–free latching. Other features for the new Fusion mounts include: Set screws—keep the mount rigid and stable throughout the life of the installation; Nesting spacers that can be stacked to achieve any depth and reduce waste; Teardrop design to speed up and ease installation through use of lag screws; Magnetized ClickConnect to make it easy to store and access pull cords; Redesigned end caps that allow cables to be routed behind the poles; Additional lateral shift, which shifts the wall plate around electrical and low voltage boxes on the wall; An integrated security lever makes safeguarding displays easier; An extension rod that provides better accessibility to ClickConnect on extra large mounts; and an interface hardware box, so when displays are mounted at a later time, you can hang interface hardware on mount rails without losing pieces. New accessories include above/below shelving, side covers, speaker adapters and CPU holders. Single stud adaptors are available for medium Fusion mounts. The shelves can be installed above or below the display, and all new FCA8XX accessories work across the wall, freestanding, and ceiling Fusion mounts, making inventory easier.